Hello, My name is Soumya, 21 year old. when I was in higher secondary school in the year 2011, I suffered from a severe backache and within few minutes I lost my sitting balance and grip in my upper limbs and slowly I lost sensation in my lower limbs. Immediately, I was admitted in local hospital and then referred to a better hospital which is Vijaya Health Care, Secunderabad. After all tests and MRI scan, I was diagnosed with Transverse myelitis(A neurological condition in which the spinal cord is inflamed). I was under medication and physiotherapy in Vijaya Health Care for 15 days and I was sent back to home and continued the physiotherapy. But, within few days after discharging from hospital I had small bedsore (wound) developed on my backbone. I was taken to Kasturba Gandhi Hospital in Warda, Maharastra for medical advices. They admitted me and did all health checkups, found the bedsore on backbone and removed all infected area. It caused a big hole and they cleaned & washed as if it is a bowl. They discharged me in a couple of days saying that I am going die in a few days. I was back to home and by God's grace a doctor visited and started treating my bedsore and it slowly started healing. I was regular to Vijay Health Care for health checkup and medicine for every 15 days and to Yashodha Hospital for the treatment of bedsore. This continued for 2 years. One of my Dad's friend advised me to go to Kerala for ayurvedic treatment and by that time my Dad spent nearly 20 lakh rupees by selling our property, my mom’s gold. Financially we were very down so we approached Sakshi TV and they made live TV show on my situation. Many people who watched the live show reacted positively and donated money for my treatment and, we have received donations from my hometown. With the support of donations, I had taken to Kerala and took treatment for 2 years. My health condition was slowly improving but because of heat generated by the oil which used for the treatment my bedsore got severely infected. So, I had to go and admitted in a local hospital for 1 month but there is no improvement in bedsore, so I came back to home. I have continued the treatment for bedsore and physiotherapy at home for 1 year then the bedsore was better. With all my medical bills, we applied for CMRF because of our financial status and I received some money from CM relief fund. I was searching on internet to know if any treatment is available for my disease and I found Stem Cell Therapy treatment in Neurogen Brain and Spine Institute, Navi Mumbai. 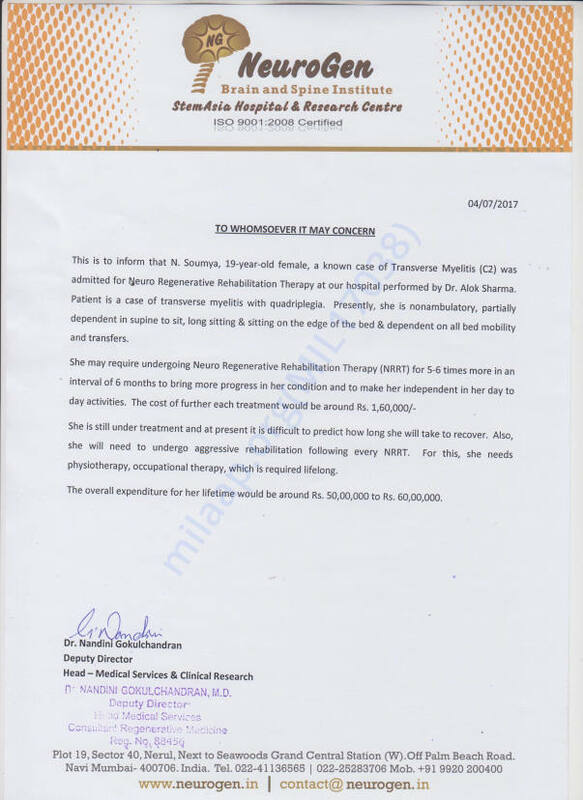 With the support of CM relief fund, I went to Mumbai and had stem cell therapy and neuro rehabilitation and observed an improvement with their treatment. Now iam in a Position that I can't even sit without support,stand and walk.iam also suffering with bedsore.if I continue my treatment in NEUROGEN hospital for 2 or more years I can walk and lead my life for that costs 5000rs per day. But we cannot afford this treatment for long, due to our financial crisis. 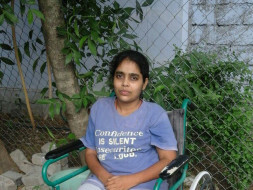 I found this platform as a blessing and ask for your help to continue my treatment. So, I am requesting you to kindly donate and help me to walk, survive and save my life. Your each donation means a lot to me. Sorry mam i've no more money.